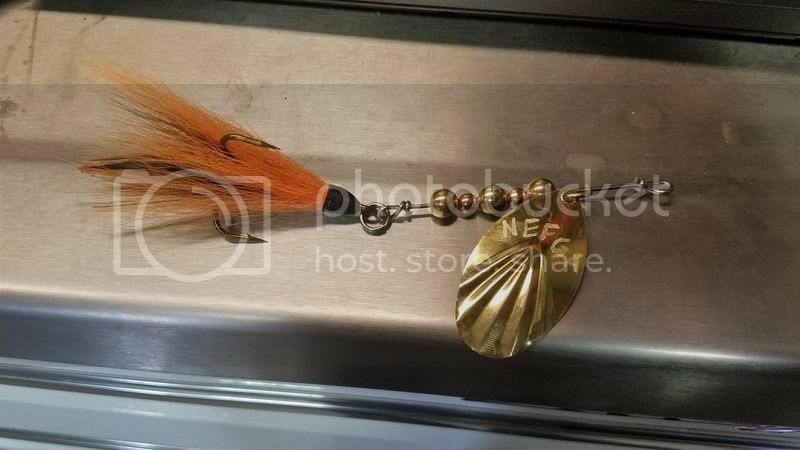 I believe this Traveling Bucktail was a custom lure from former NEFGA.ORG Moderator, Brad H. I DO have a "sister" of this lure I received at about the same time from Brad and if asked, I would donate it "to the cause". More florescent in colors, she is NOT an "identical sister", although she is a "twin". Take a DRY "q-tip" and run it around inside the guides of your rod. IF there is a scratch on the inside, you will find a bit of the cotton hanging! That is all it would take to split the line when casting! More likely it is a negative aspect of braid: ie Fireline; Powerpro. Any possible "whip" in the line at the rod tip will send the attached lure "off to see the world" and the only explanation is the "strapping tape" affect. If you know how to TEAR the fibered strapping tape (yep, I'm OLD!!) you will understand "the affect". I've lost MANY spinnerbaits due to this "phenomenon", retrieved a few because the line floated long enough to find it! I have sent a few lures into the weeds at Pelican this way. 30lb braid like to snap when you get a backlash too. If Joe can produce a "clone" to continue the thread, I am all-aboard with that generous offer! Last edited by Harold; 06-05-2017, 10:55 PM. Awesome guys keep it gong! Harold, I appreciate the offer but I had my turn and wgibson26 has been patiently waiting so it should go his way. Do you have access to a boat and a magnet? I took our boat out and used the net to scoop the bottom where I saw it go in. Didn't have a magnet on me at the time. I combed the area pretty thoroughly with the net, but to no avail. Rats!! Do you have scuba gear? Any one got metal detector? Would that work ? Well, it's no clone, but I put this together this weekend. Hopefully we can get it to catch fish all over the state! It's a small enough size that it can easily be casted on medium heavy spinning gear. wgibson26 I got your address from Harold, and will be sending it out tomorrow. ps.....I may throw a little extra in the box. Package is in the mail. I drew up a little log book and put it in the box as well so we can see how it catches fish. Looks like a fish catching machine!! !